Yesterday we mentioned that the Flip camcorder was taken off the market by Cisco. One of the reasons for the Flip’s demise may be the ubiquity of camera and video recording capabilities in portable devices such as smartphones and iPods. When Apple upgraded the iPad, they added no less than two cameras to the tablet: a front-facing camera for use with FaceTime video-conferencing, a rear-facing camera for photos and video recording. Apple clearly made some trade-offs (resolution, cost, power consumption, etc…) when choosing the cameras for the iPad2. According to Apple, the rear camera can take 720p videos. This translates to images with a resolution of 1280 x 720 pixels (0.92MB). Apple realizes the technical details of the cameras were nothing to crow about and has pretty much left it off the iPad2 spec sheet. However, just because the iPad2’s current cameras are pretty lame from a specs perspective, the addition of a camera to the iPad’s large portable multi-touch screen can be a powerful combination. Last Summer, we reviewed a bunch of digital microscopes for RainyDayScience’s BackyardBiotech project. We found the microscopes to be capable but impractical for field use. We tried to find a way to attach one of those digital microscopes to the iPad. Even thought they were all USB devices, none of them were supported on the iPad. When Apple announced that the iPad2 would have built-in cameras, we were hopeful that we could somehow use them as a digital field microscope for the BackyardBiotech project. Most cell phone cameras have a minimum focusing distance of at least a foot and the same appears to be true for the iPad2’s rear camera. The key question is, will we be able to find a way to get the iPad2 rear camera to focus close enough to be useful. A few years back we did a project where we used a slide loupe as a closeup lens for a Canon point-n-shoot digital camera. The setup was simple to use and the quality of the images were surprisingly good. We thought the same approach was worth a try with the iPad2. 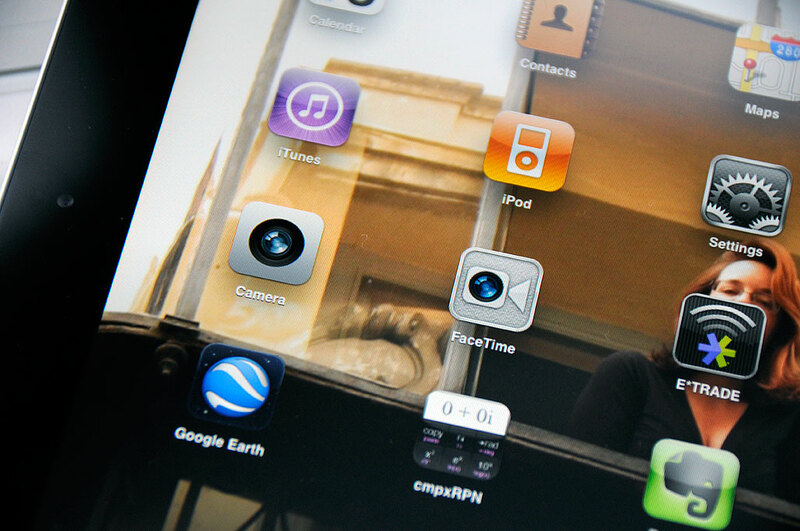 Unlike the loupe/Canon S100 rig, the iPad’s camera is off-center in one of the corners. We had to devise something to support the tablet during use. Fortunately, we discovered that our Nikon lens hood is the same height as the loupe and worked great as a stand for the iPad. Results from our first series of tests were quite encouraging. The setup is quite stable, the resolution of the images is acceptable, and the color rendition is surprisingly accurate. In its current implementation, the rig would not work that well out in the wild. However, we have achieved our first objective and demonstrated the hope of using the iPad camera as a microscope is viable. What we need to do next is to make the setup more mobile. We have some ideas and will share them in the Summer iPad issue of RainyDayMagazine.